For kids growing up in immigrant families, life can be a mashup of the harmonies and dissonances in navigating the cultures. 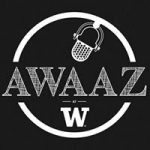 A group of University of Washington students founded the South Asian Fusion acapella group, Awaaz. We had a few of the members of the group in our studios recently. They’re Team Manager and vocalist, Sonali Toppur, Musical Director, Sarang Joshi and beatboxer Khalil Somani. Toppur shares where the desire to mashup music comes from. Also check out their rendition of the song “Ain’t no sunshine”.